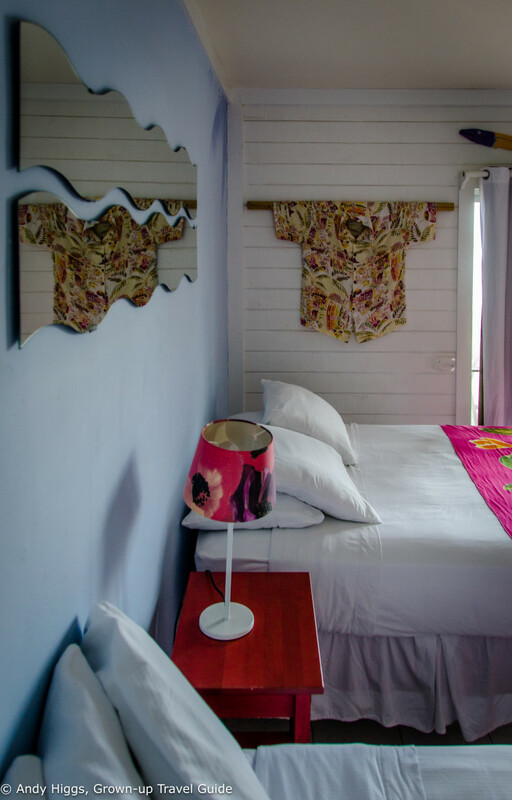 Since it was a sponsored trip my accommodation was not chosen or paid for by me; however my opinions are my own and the point of all my reviews is to tell you whether I would stay at a hotel using my own money in the future. 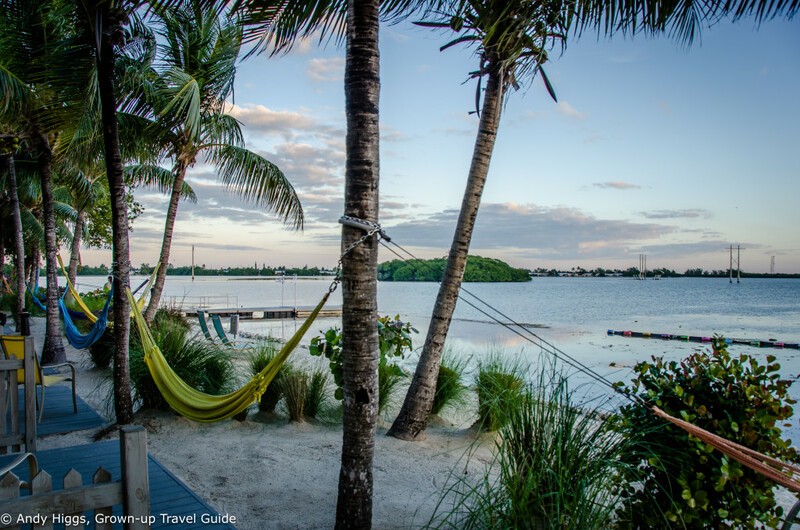 Tourist boards are generally good at picking places to stay and Key West was no exception. 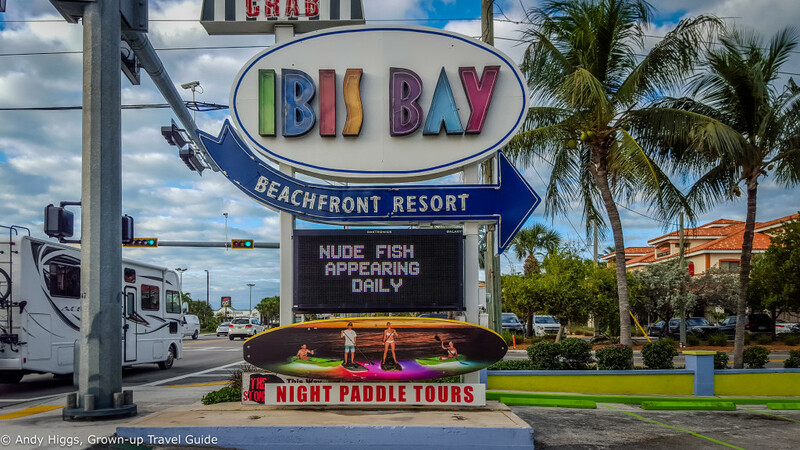 We spent the first three nights of our visit at the Ibis Bay Beach Resort, located just outside the centre of town on the waterfront. 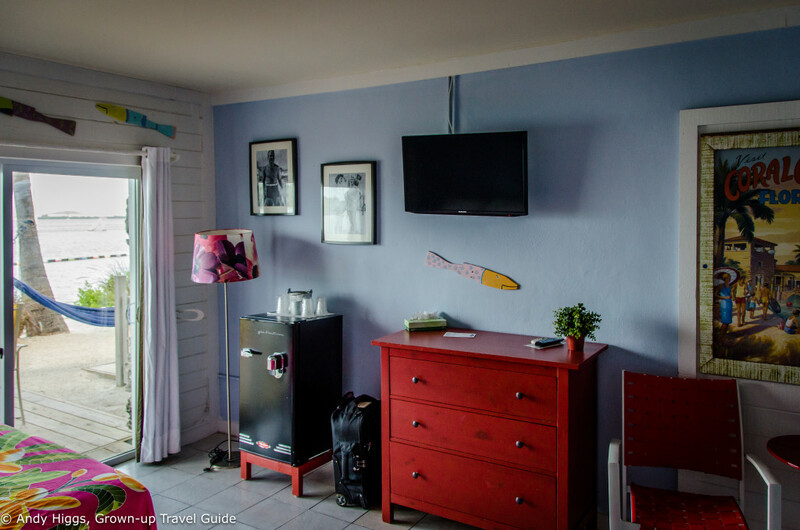 The concept for the Ibis Bay is that they wanted to maintain the original 1956 style but add all the modern amenities guests look for in the 21st century. 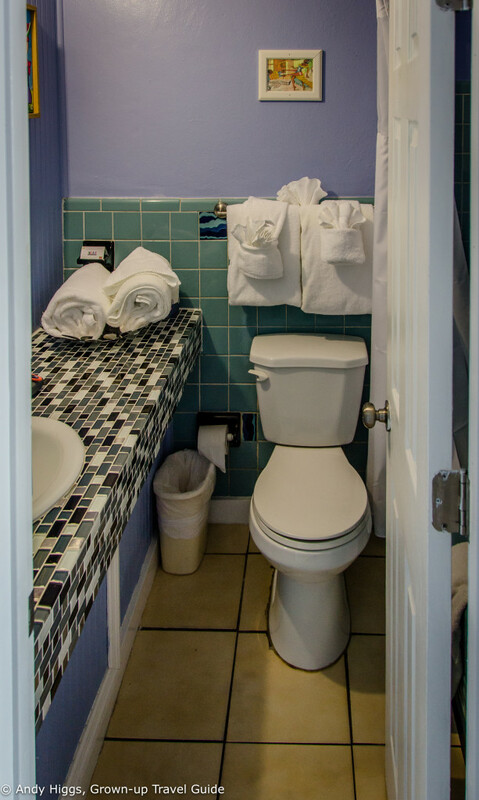 It’s all been done with colour and humour – just as you’d expect in Key West. 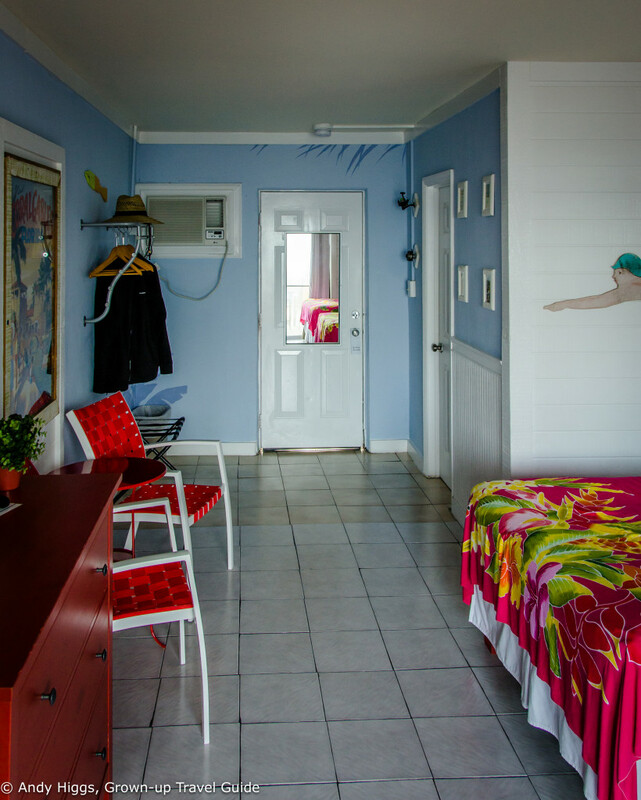 The Inn has 72 rooms, none of which are identical and fall into a number of categories from value rooms to the Family and King Suites opening on to the beach, garden or a patio. 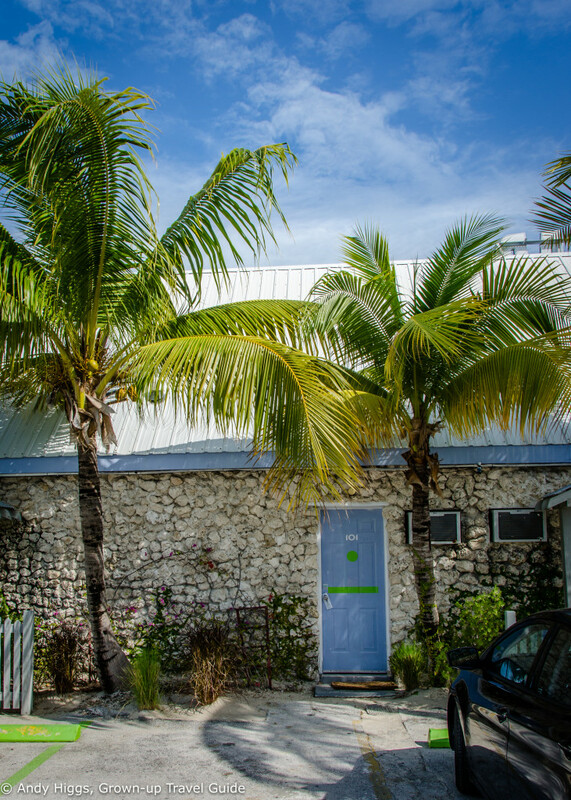 Located right on its own 600 foot beach, the Ibis Bay is situated a couple of miles northeast of the heart of Duval Street on the main road out of the city. There are other hotels, stores, restaurants and cafes in the area and the hotel operates a free shuttle bus to and from several stops downtown. 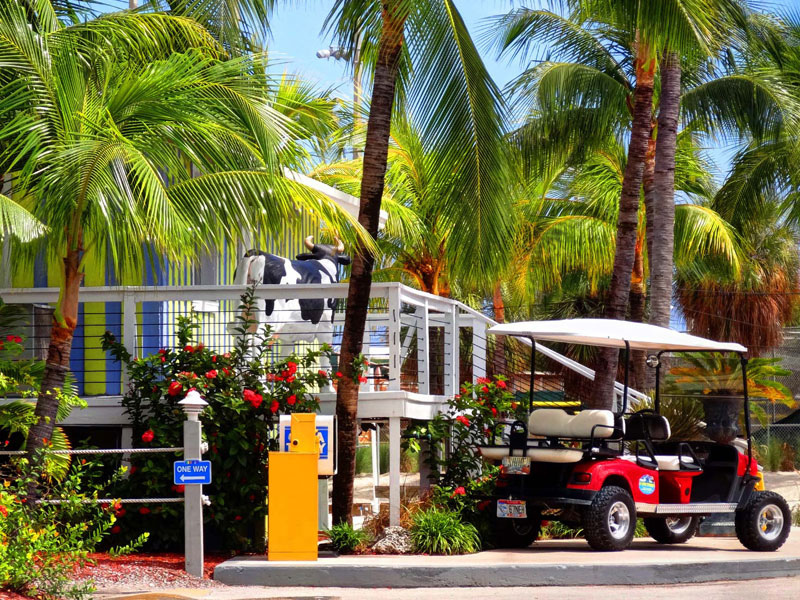 There’s plenty of free parking on the property – you can generally park right outside your room in traditional motel style. 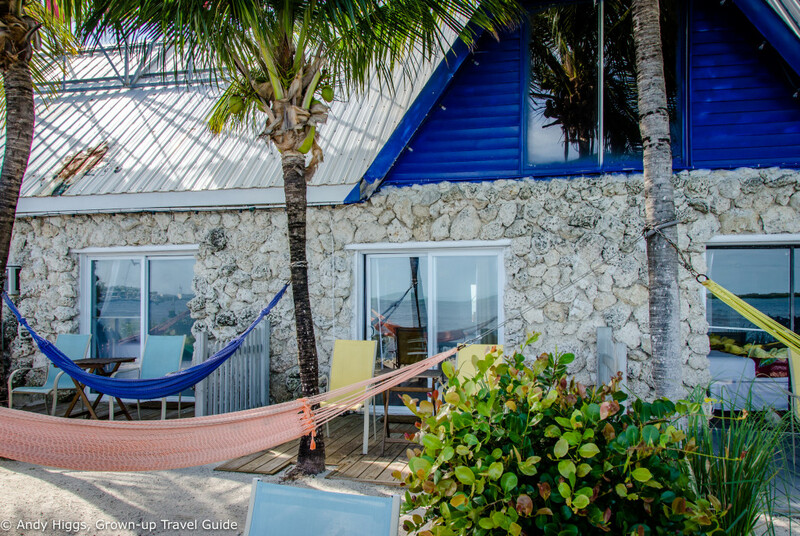 If you are looking for the colourful, fun style of Key West in a quiet environment at an excellent price, the Ibis Bay is for you. 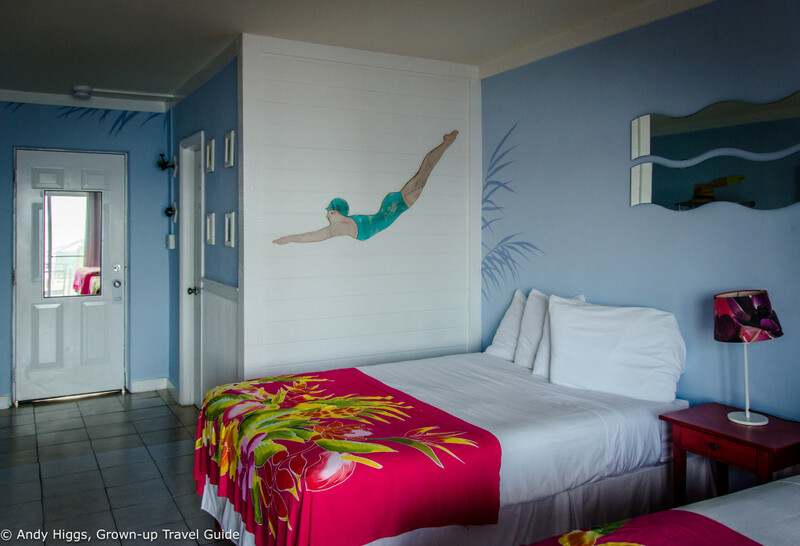 I love the old-school motel design with all the mod cons you need. 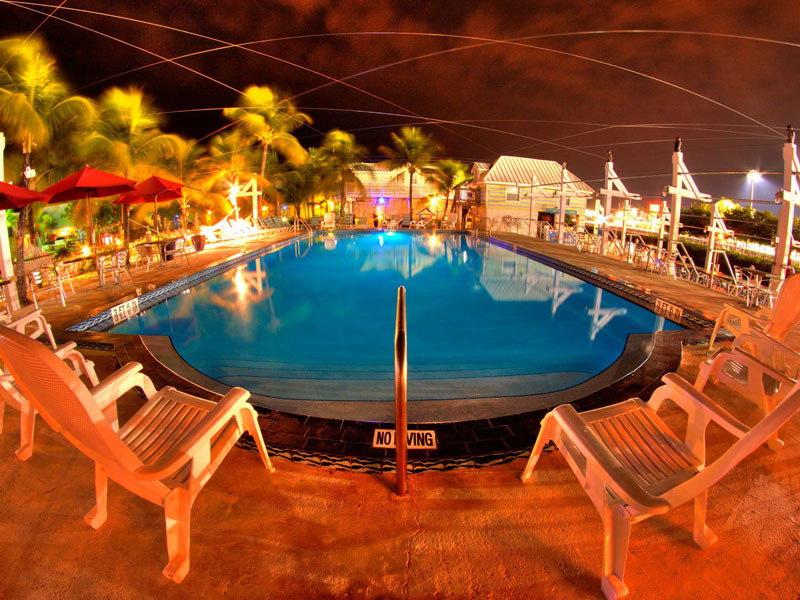 Key West is not a beach resort, yet the Ibis Bay gives you the beach resort feeling close to the city. 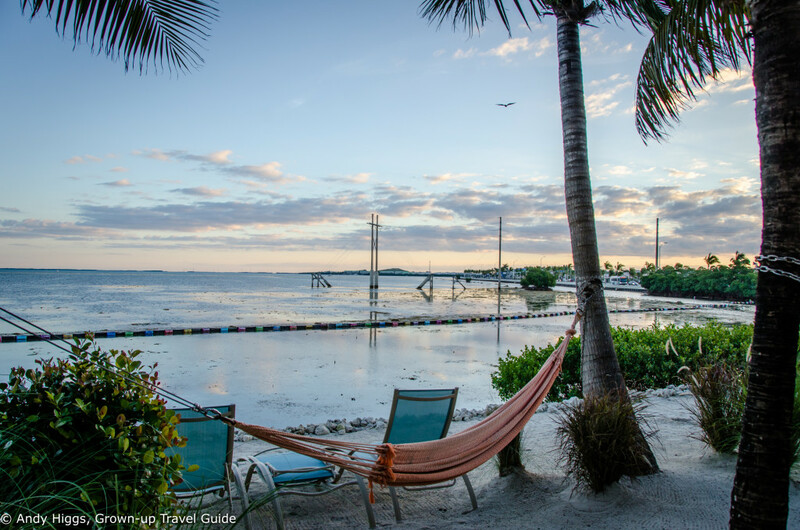 Waking up to a fabulous sunrise over the water and having a coffee in your own hammock is reason enough to pony up for the beachfront rooms. 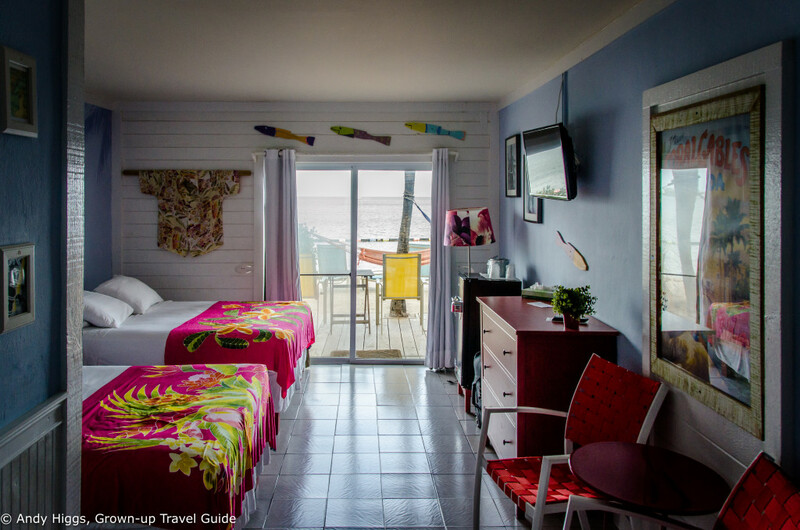 I was given the keycard for one of these beachfront rooms, number 101. As you can see I had a hammock and sunbeds for my use as well as chairs and a table on the decking outside. Room 101 is in the middle of the picture here. 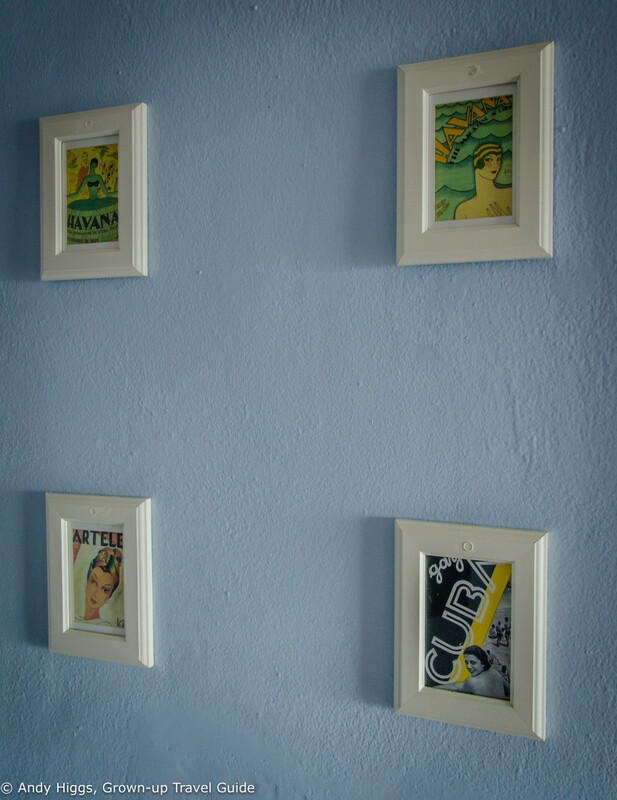 The room was spacious and bright, stylishly decorated with old posters, photographs and colourful bedspreads. I had two big and comfortable double beds to choose from. 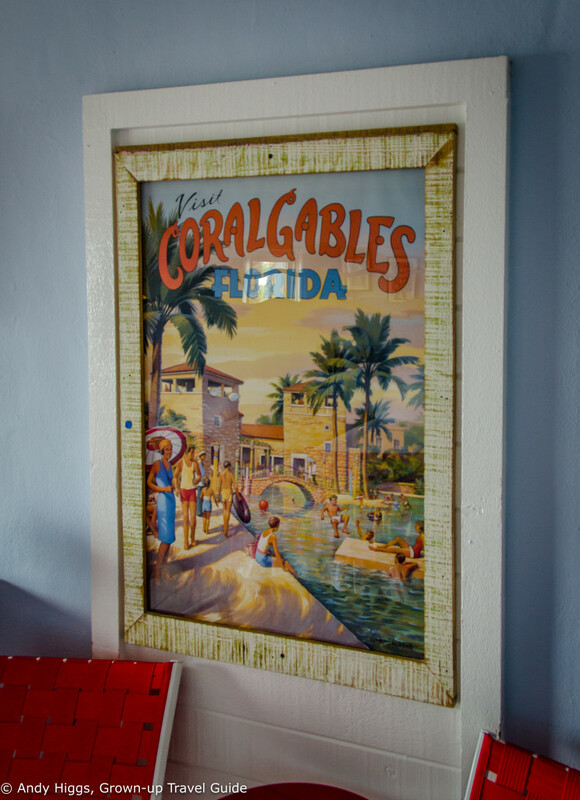 Air conditioning is basically standard – and generally essential – in Florida but during our stay in late January I didn’t find it necessary during the night. A refrigerator is a useful addition and the flatscreen TV had the usual countless poor quality channels to choose from. 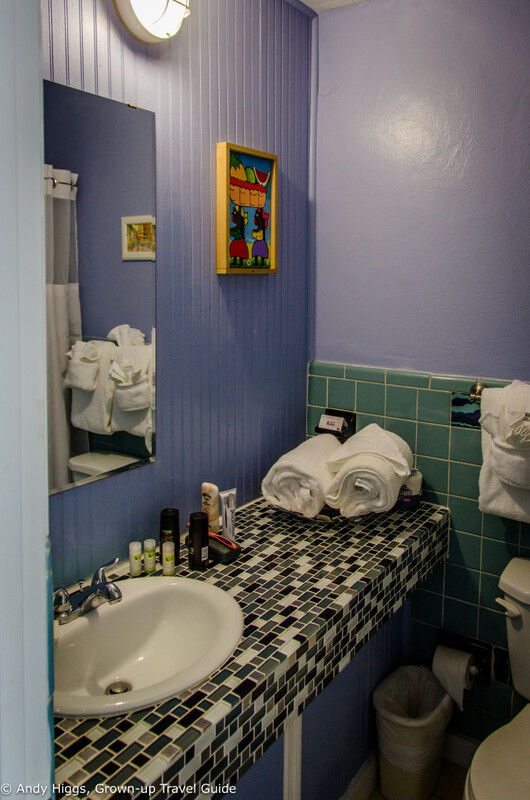 Other nice details include the short on the wall and the wavy mirrors. Storage space was good for a couple. I loved the old posters. These pictures were cool too. 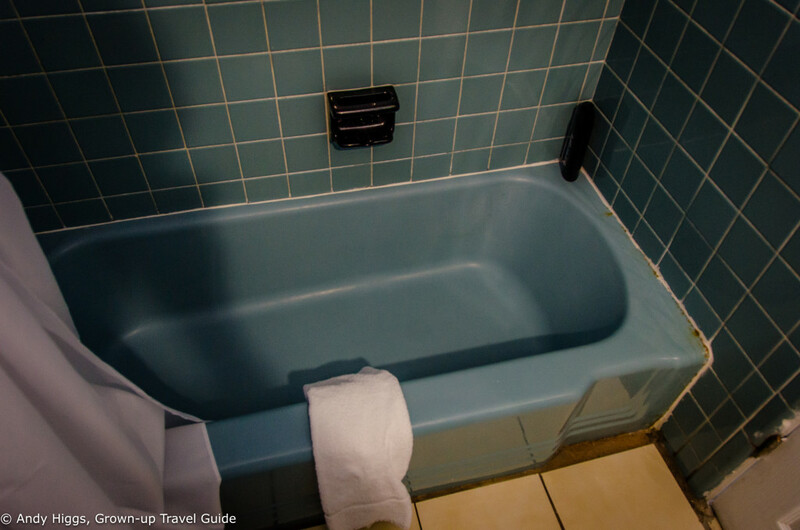 The bathroom was small but included a full-sized bathtub with a good shower. 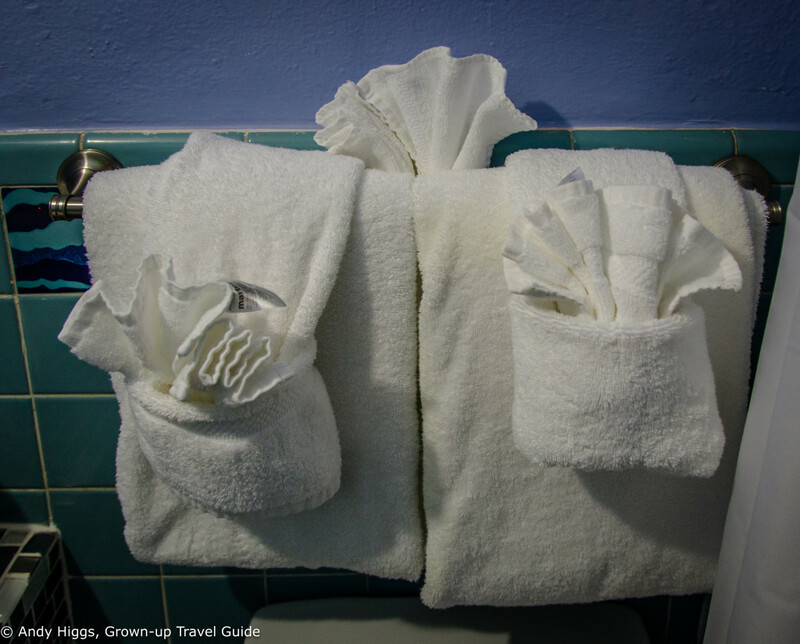 Plenty of towels were provided, as you can see. 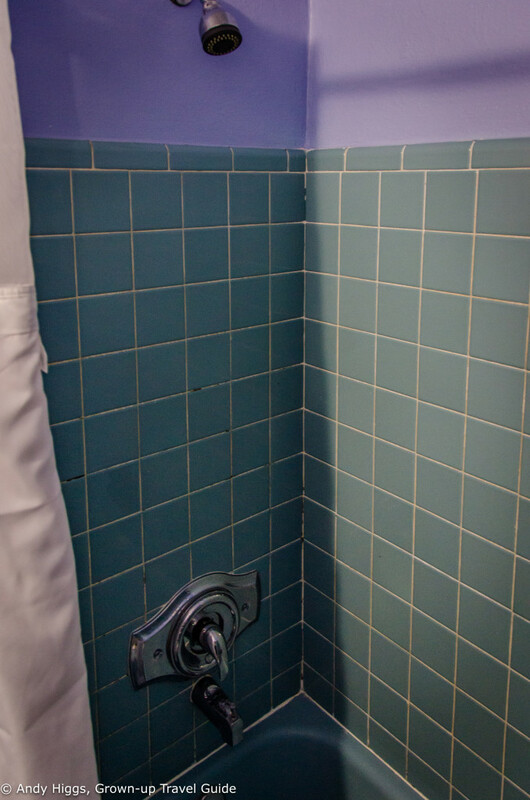 The tiles had seen better days, but the bathroom was generally clean. The grouting round the bathtub could definitely have done with a little refurbishment. Oh yes. 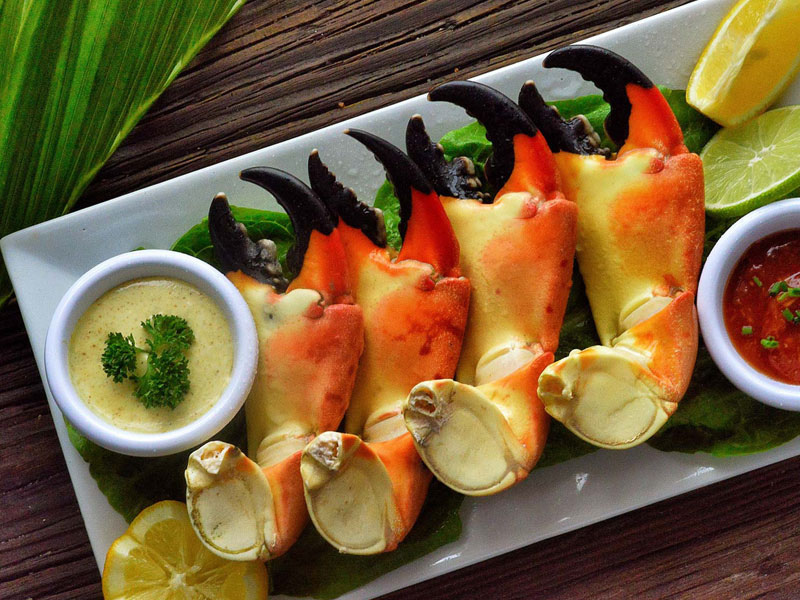 The Stoned Crab boast some of Key West’s freshest seafood and specialises in, well, stone crab. 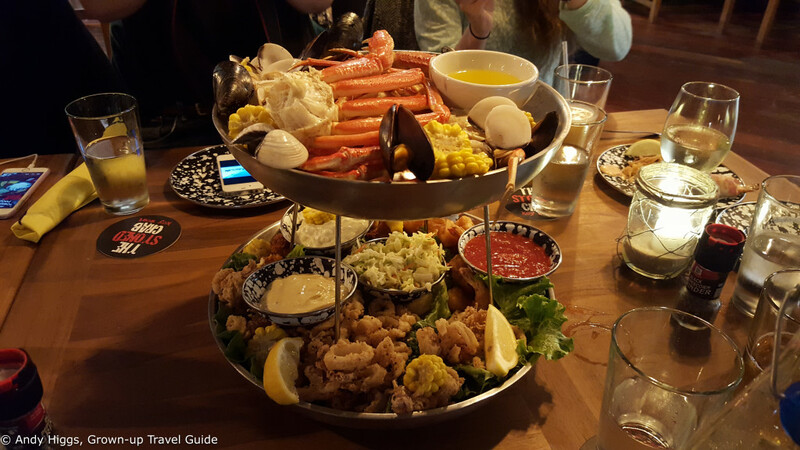 Two private fishing boats bring in catches every day and the quality of dishes is excellent. The Ibis Bay has a great swimming pool that we unfortunately did not get a chance to test drive. Next time! No, breakfast is extra but well worth splashing out for. 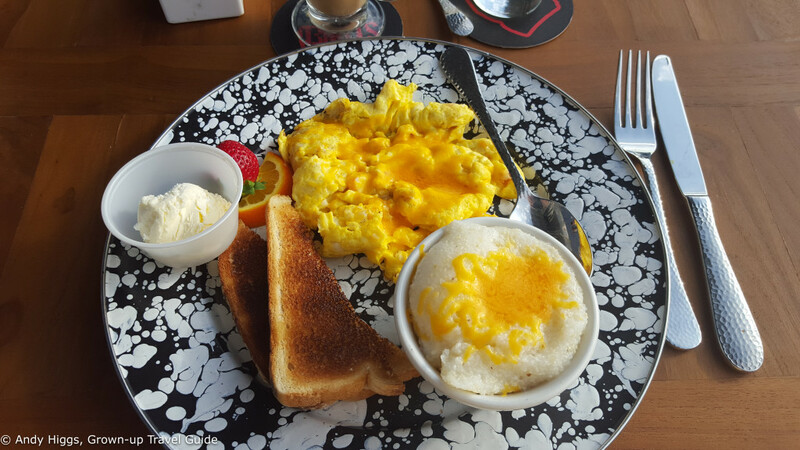 And like me, you gotta eat grits when in Florida! Service was excellent – everyone was extremely friendly and helpful. The value rooms start at USD 209 but the beachfront ones with two doubles like I had cost USD 269 and upwards. That represents very good value for a couple with a child, for example. 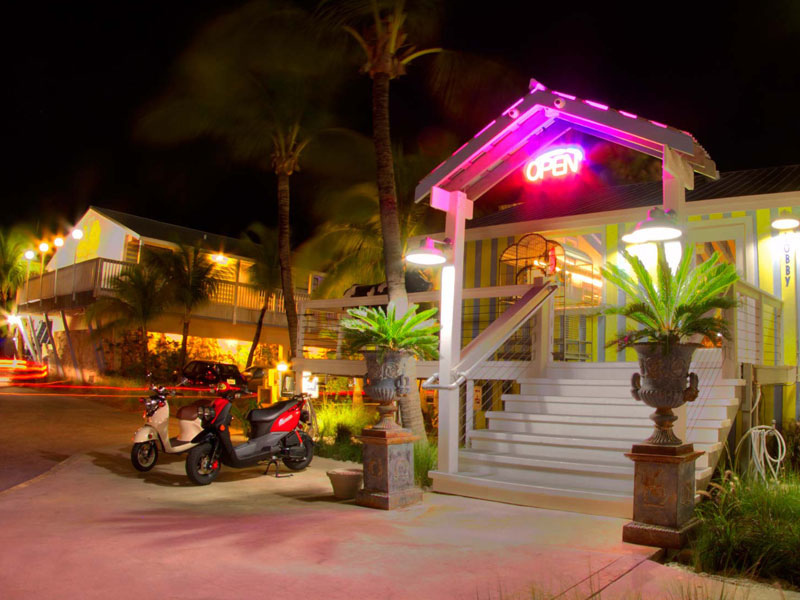 I loved the style of the place, the quiet location, the beach resort feel and the superb restaurant. The bathroom could do with an upgrade – it’s just cosmetic but would improve the overall feel. 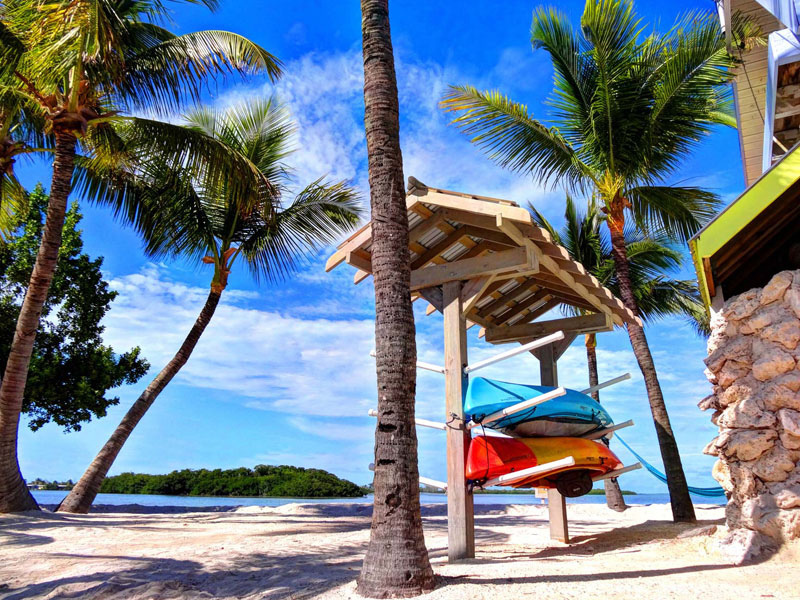 The Ibis Bay Beach Resort is an excellent place to stay in Key West – and is great value too. 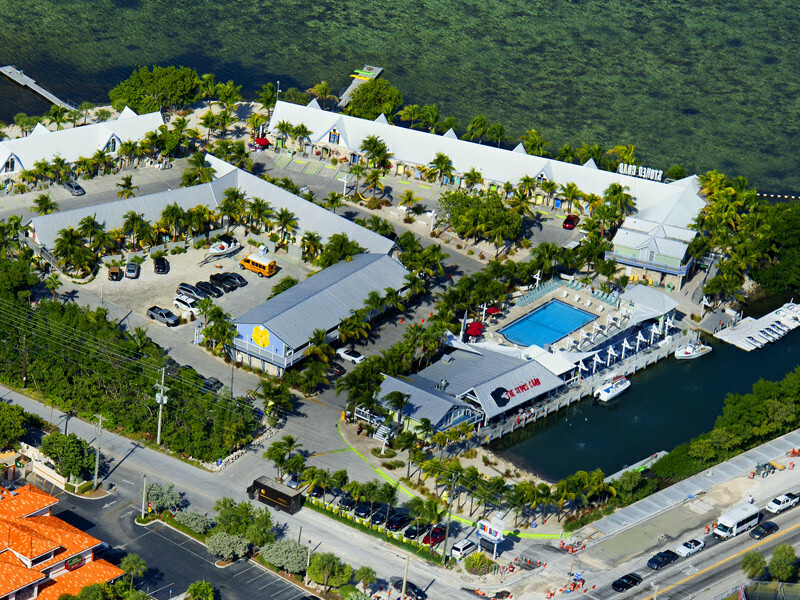 I will be returning here next time I’m down in the Keys. The hotel can organise a range of activities both in town and on the water, including night-time paddle boarding which we were due to test out but the weather got in the way. 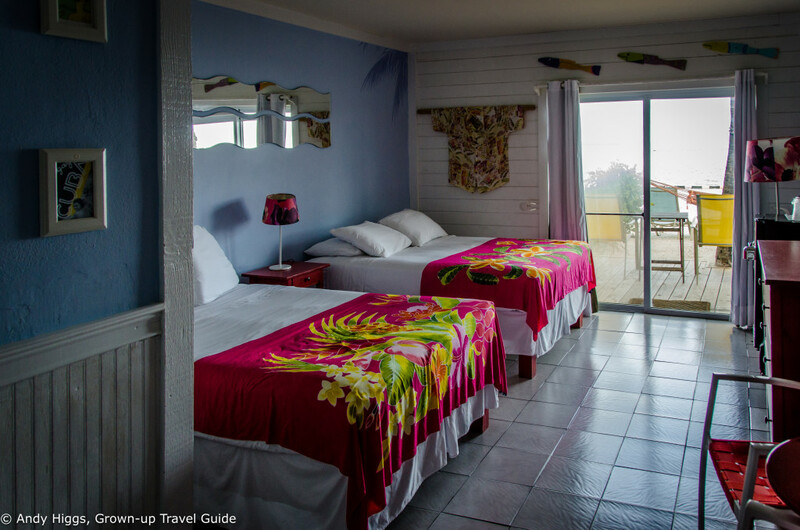 As mentioned before, we were guests of the Ibis Bay Beach Resort but my opinion is based on paying to stay.